"I've reversed the jelly baby of the neutron flow"
An interesting conclusion to Matthew Graham's two part story, The Almost People certainly opens up much of the debate about biogengineering ethics and identity that last week's episode introduced in the form of the flesh gangers and their increasing sentience. To spark much of this debate, and to raise our awareness that the narrative here is actually a significant part of the series arc of which the Doctor has a greater awareness than we first thought, Graham uses a series of ganger/human parallels embodied in the back stories of his characters. Primarily, he takes the initial idea of Jimmy's role as father, which his duplicate has awareness and memories of, and uses this to, pardon the pun, flesh out the exploration of sentience, consciousness and will at the heart of the story. He then adds further to this with what we discover about Miranda Cleaves. When the Doctor scans her he diagnoses an inoperable blood clot, the symptoms of which both her human and ganger form share. What Graham seems to be saying with these two sub-plots is that for the gangers to truly become sentient they must accept the burdens of human emotions, specifically their weaknesses as well as their strengths, and the body's physical frailty. With sentience comes responsibility for the self and others and an acceptance of mortality, as we see both in Cleaves's challenge to her duplicate with, "Of all the humans in all of the world you had to pick the one with the clot. But, hey, them's the brakes. Welcome to the human race" and Jimmy's death by acid where the flesh-Doctor hands over the symbol of patriarchal rebirth, the ring, to the ganger version and confirms, "Jimmy Wicks... you're a dad." Both Jimmy and Miranda are effectively redeemed, along with the flesh-Dicken, by the end of the episode. After the flesh-Miranda sacrifices herself along with the flesh-Doctor (and it wouldn't be Doctor Who now without these ubiquitous moments of self-sacrifice) the TARDIS stabilises the flesh versions of Jimmy and Dicken, Jimmy is then reunited with his son, Miranda's clot is sorted out with something "small and red and tastes like burnt onions" and, more importantly, the Doctor's rationale for coming to the factory is revealed. 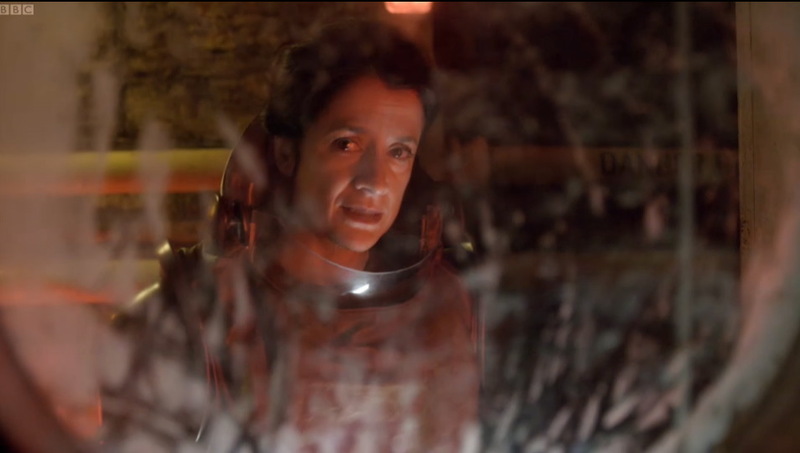 This redemption is all part of the episode's meditation on "being in the world" and about how physical and emotional connections to the concept of the self are not fixed, much as the gangers may want interpret the self as such. They remain unstable even after the freak storm that imbues them with an individual status and a life that is divorced from the psychic link to their human counterparts. They may be raising their consciousness, and towards revolution as far as Jennifer is concerned, but they will still have to deal with the consequences of this emancipation. As Harold Fromm explains in The Nature of Being Human, our lives as humans are shaped by rhetorical triggers and, "people are changed, unwittingly, willy-nilly not by "self", not by choices... the possibilities look open-ended but you can't will them into being for yourself." The Almost People shows us that the gangers' desires to be more than the sum of their human counterparts memories go beyond just fulfilling the function of information storage mechanisms and flesh-Jimmy must eventually connect the memories he has of his son to the real person in the real world, emotionally and physically. Jennifer refers to this as an "act of weakness" (countered by the Doctor's view of it as "an act of humanity") and her growth in the story, trapped into becoming an ever changing shape of rage against humanity, is predicated on the bitterness that Frankenstein's creature has in regard to his own creator. This eventually sees her as separate from the developing self-realisation of the other gangers, as a Miltonesque Satan railing against God, with the problematics of attempting to be human a familiar trope in many stories about doubling and doppelgangers. What this also intimates is that the flesh copies of the originals can only become truly sentient when they admit their existence as copies and, once the copy stops thinking of itself as the original, it becomes an a person with a 'soul'. 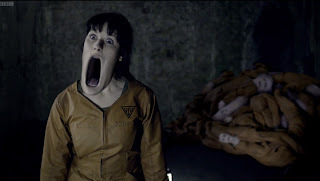 When Jennifer remains soul-less, as a raging monster attempting to kill everyone, then morally it is the only way to accommodate the flesh-Doctor's destruction of her, perceived as 'other' than human. 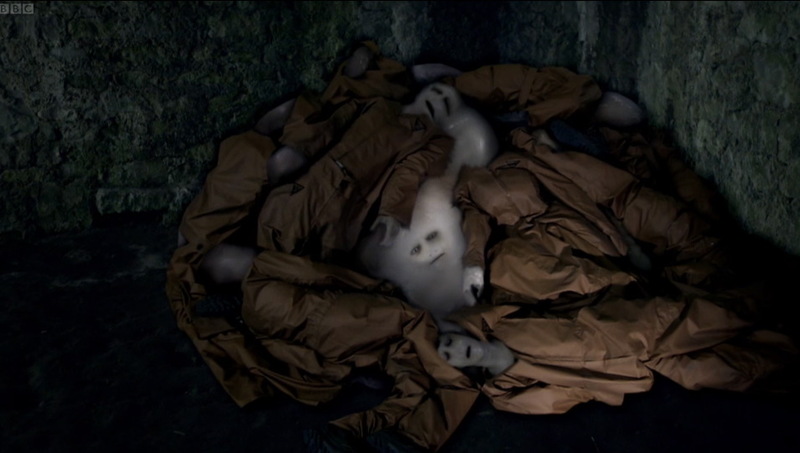 This trajectory for the characters neatly dovetails with the introduction of the flesh-Doctor as an intriguing way to test Amy's loyalties to, and perception of, the Doctor himself, and with Rory's empathy (perhaps as a former Auton) directed to the multiple Jennifers and her horror, as demonstrated by the pile of discarded flesh bodies and the tunnel of accusing eyes, at the way their innate sentience has been disregarded by the 'inhuman' capitalist ambitions of the company, Morpeth Jetsan. Incidentally, that's an anagram for Phantom Jester which is itself an ironic little wink to the themes here as well as a Doctor Who series that's obsessed with doubles and duplicates - two Doctors here and in The Impossible Astronaut and now, two Amys. If you remember last week, the Doctor was very cagey about his knowledge of the flesh and the factory's technology. He let it slip that he was aware of this technology and that this was an early form of the flesh. 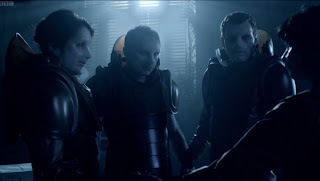 With the delegation of Miranda and Dicken arriving at Morpeth Jetsan's offices to lobby for changes in the way the technology unfortunately creates the side-effects of sentience in the gangers, the Doctor has been seen to deliberately ensure that both human and ganger understand that these side-effects are dangerous and need to be resolved. As he says "I needed to see the Flesh in its early days. That's why I scanned it, that's why we were there in the first place" and he's already suspected that Amy isn't quite who she seems to be with his suspicions aroused by the quantum pregnancy on the TARDIS scanner, her confession to him (cleverly fooling her into believing she was imparting this information to the flesh-Doctor) about the visions of the Eye-Patch Lady and, most importantly, the invite to witness his death in The Imposible Astronaut. 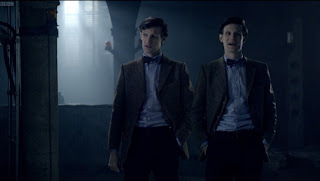 The Doctor and the flesh-Doctor, and the testing of Amy to see if she could tell them apart, therefore become analogous to how characters like Amy distinguish good from evil. 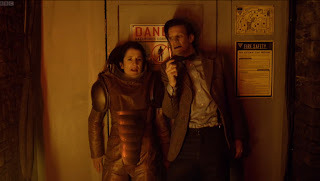 The real strength of this two-part story lies in Matt Smith's extraordinary performance as the two Doctors and his ability to obfuscate the audience and Amy's perception of which of them was the 'real' Doctor. What must have been a daunting technical challenge is carried out with great subtlety, timing and humour and it even allows him to channel the previous Doctors - from quoting the First Doctor's desire to return to his own planet, trotting out that old favourite "reverse the polarity of the neutron flow" and to actually plonking Tom Baker's own voice onto the soundtrack proffering jelly babies. It's again clear why Moffat cast him as he progresses through this (even hinting at Cybermats for future episodes perhaps) and onto those later powerful scenes with Amy in the monastery and in the TARDIS. The gangers are not evil per se, they simply want their rights to exist acknowledged, and their origins, how they are made and their question of sentience, is certainly what feeds into the last scene where the Doctor confronts the flesh-Amy. 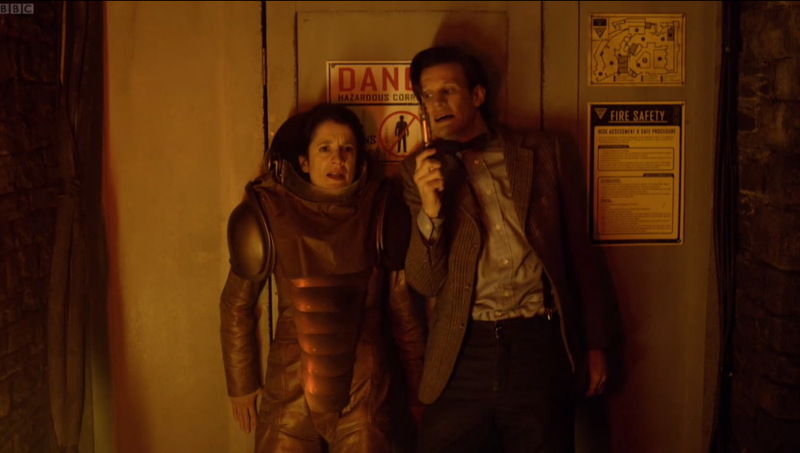 Many fans have become rather concerned about this scene because they believe the Doctor was morally wrong to destroy this copy of Amy. But the flesh-Amy simply has no independent existence. It's just a conduit through which the real Amy, alive, well and pregnant and who knows where, is experiencing the events of these episodes. The gangers created at the monastery, out of early flesh technology, are capable of sentience. Their autonomy only comes about because of the solar storm. The flesh-Amy, presumably a result of much later flesh technology, is not autonomous. It is completely unaware of itself as a copy. Like the humans operating their ganger bodies we saw in the first part of the story, Amy is psychically wired in to the copy, and as Matthew Graham explained on Doctor Who Confidential, it is the copy of Amy that has died and not Amy. 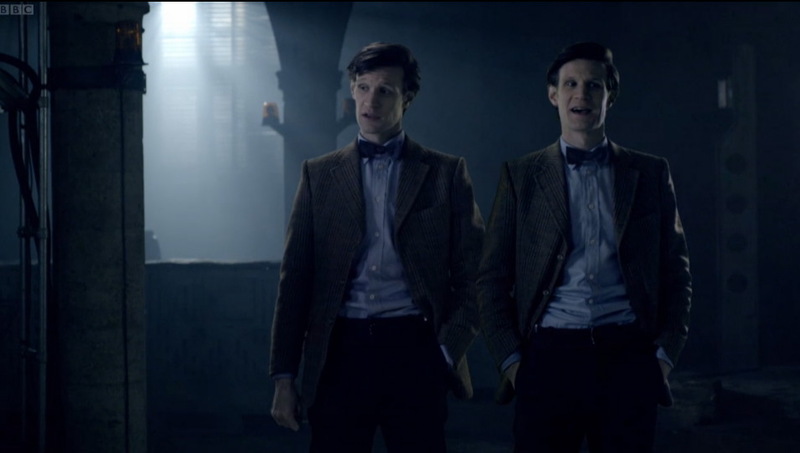 However, the scene does again show that the Doctor's morals are of a shade of grey. He is not the non-violent pacifist that fandom's received wisdom alleges him to be. As Piers Britton in Tardisbound suggests, "this assertion belies a massive weight of contrary evidence" and the Doctor often endorses "the idea that violence has its uses or at least in certain circumstances that it is unavoidable." As he severs the link between Amy and the flesh version of her, he even acknowledges that what he is doing isn't as morally appropriate as he would like and argues that he will "be as humane as I can, but I need to do this." It's a very dramatic ending to the story and certainly clarifies our understanding of Amy's visions of the Eye Patch Lady as impressions from the real world bleeding occasionally into flesh-Amy's perception. It also suggests the Doctor manipulated events at the factory in order to gauge the nature of the flesh-Amy (the real Amy having "not been here for a long, long time") in contrast to the independence of the gangers at the factory. What's interesting here is Rory's reaction and how his rejection of Amy suggests the dynamic between him and the Doctor has significantly changed. 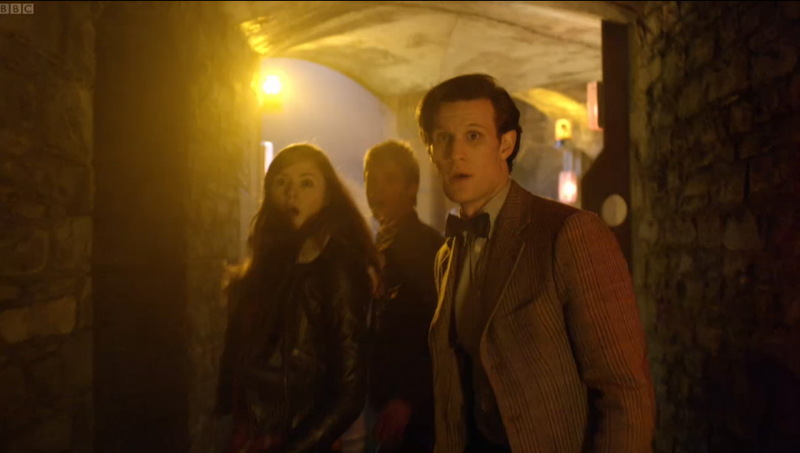 He is horrified at what is about to happen but clearly trusts the Doctor and allows him to carry out his destruction of the flesh-Amy. 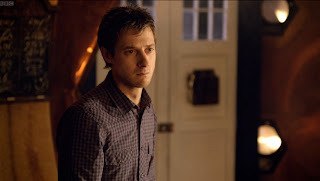 There's something in his eyes, thanks to Arthur Darvill's performance, that really captures that instant realisation that the Amy he is stood next too is not the real one. This is a great climax to the sub-plot that has seen Rory's trust manipulated by Jennifer, still implying that he's easily led emotionally despite his fervent belief in Jennifer's cause when she shows him the pile of abandoned flesh. With this revelation we will hopefully see Rory properly defined as a character with greater physical and moral strength in the forthcoming A Good Man Goes To War as despite the convictions he displayed in this two-parter, he fell into Jennifer's clutches far too easily after a bit of ego flattering. "the eyes are the last to go"
The horror film tropes continue to be applied with aplomb by director Julian Simpson with the tunnels of the monastery perhaps even thicker with atmosphere, the Gothic space implying a descent into the unconscious where Jennifer's monstrosity is perhaps again symbolic of the primitive forces that battle against the gradual self-awareness that Jimmy and Miranda begin to acquire. The pulsating amber lighting that illustrates the desperate chases in the bowels of the factory are redolent of Ripley's journey through the Nostromo corridors with Simpson capturing some of Alien's disorientation and confusion to match Matthew Graham's own themes of out of control corporate imperialism (for Morpeth Jetsan read Weyland Yutani) blithely disregarding the consequences of creating a slave class. Again, we have more images of the shape-changing Jennifer, this time appearing as something of a cross between the ever morphing nastiness of John Carpenter's The Thing and the series's own beastie as seen in The Lazarus Experiment. The abject-Jennifer could be read, as Kelly Hurley suggests in The Gothic Body, as "a not-quite-human subject, characterised by its morphic variability, continually in danger of becoming not-itself, becoming other." It's characteristic of the story's depiction of the problems of stabilising identity, especially in the running themes of the gangers wanting to create a human self-hood and the monastery itself operating as a charnel house with extraordinary images of piles of ganger bodies rotting away and of accusing eyes embedded in its stone walls, emblematic of Jennifer's claim that "the eyes are the last to go" when a ganger's physical form is destroyed. If there is a problem with The Almost People then it is the slight uneveness between the fascinating ethical debate about identity and free will and the requirements of the episode to rely on the 'running down corridors' and 'monster of the week' tropes that constitute much of the closing scenes of the story. There is also the problem of the under-developed characters Buzzer and Dicken. Dicken is probably the most underdeveloped of the two and yet we are asked to emotionally connect with his self-sacrifice at the end of the episode when all we've really found out about him is that he sneezes quite a bit. A little bit more development would then have made the flesh-Dicken's earnest mission to face Morpeth Jetsan with Miranda much more credible. Apart from these quibbles, The Almost People asks viewers to contemplate some very adult moral questions and in its final scenes suggests that the flesh-Doctor knows more about Amy's pregnancy than he should and may make a further appearance if the suggestion of his "molecular memory" surviving the destruction of the monastery is anything to go by. Overall, a satisfying conclusion to last week's opener as well as a startling springboard to the mid-season finale. Note: For more on Series 5, including all the expanded reviews from 2010, try my book Doctor Who: The Pandorica Opens - Exploring the Worlds of the Eleventh Doctor published by Classic TV Press and also available on Amazon. I was really pleased by this episode (pair of episodes) - far more than I dared hoped for after the less-than-scintillating 'Fear Her'. I agree that some apart from Jennifer and Miranda, the gangers were rather weakly constructed. But even so: proper body horror stuff going on in Doctor Who again! Whee! Seriously though, I just wanted to briefly de-lurk to offer thanks for your always excellent reviews. (I used to occasionally de-lurk at Behind the Sofa and was given a copy of The Pandorica Opens which has to qualify as one of the nicest gifts I could have received between DW seasons). Thanks for such smart and enjoyable reviews! I have a few issues with the use of sentience within the story as it often seems a little inconsistent. Agree, good to see some nasty body horror stuff back in the series. Perhaps the most Hinchcliffe-like the new series has been! 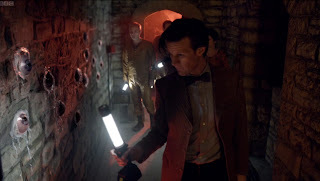 I'm still troubled by just how many sonic screwdrivers were flying around and which Doctor had them. Both the flesh-Doctor and the real Doctor produce sonic screwdrivers when they shouldn't even have them! Other than that, Graham's scripts are more suitably adult here and he's produced a decent pair of episodes. Keep lurking and reading. Hope you enjoyed the book. Nice review. 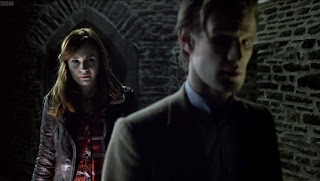 I think a simple way of resolving all the conflict between the Doctor recognising that the monastery gangers have human rights and then casually dissolving the Amy gangher lies in the end of this story. The survivers from the monastery go into the Morpeth Jetsan boardroom to persuade them that the gangers have a form of independent consciousness. I think we possibly assume that there are two possible results of this. Either the company ignores them and carries on abusing the gangers or the company has a change of heart and starts treating gangers as people with rights. But there's a third possibility. Maybe the company just decides, for reasons of morality or safety, to further develop the Flesh technology so that it is incapable of consciousness. And it's this more advanced version which we see in the Amy ganger. Anonymous - Precisely. I view the flesh-Amy as the latest version of the technology, one incapable of sentience. Hence, she couldn't be affected by the solar storm and the moral implications of the Doctor 'killing' her are much greyer. As for Jennifer, apart from the techical issue of whether the machinery for making a copy would accept Flesh or how the secondary copy is to be envisaged as being "operated", if it is being operated, there is the obvious inconsistency of her making and using such a copy in the way she did, which I suppose has to be attributed to her growing madness, but seems a particularly bad fit with the explanation for it given (and, of course, vividly shown).Perhaps, however, there is consistency with the original's "real character", given that it was Jennifer's horseplay that led to the destruction of the first ganger-Buzzer despite her supposedly being originally a sweet girl, in ganger-Miranda's eyes. There is a lot of scope, not explored here, in such scenarios for exploration of the differences between appearances and subjectivities, the opinion/knowledge others have have of you and the one you do of yourself, as also of the phenomenon of divergence between the two versions. A Dicken presumably survived just because he would initially seem the least likely to, the most redshirt-like. I was expecting (partly on the basis of the photo in the Radio Times) the gangers to capture and use the original Buzzer to recreate their fallen comrade. But then again why should they or why should they think it their comrade that they would be recreating? I have to report that I won't be able to "officially" see this episode until this Saturday. In it's infinite wisdom, BBC-America decided that, as this past weekend was Memorial Day, they'd have fewer viewers. This despite all the hype about transmitting series 6 on the same day the episodes were transmitted in the UK. So what did they show this past Saturday? A Doctor Who marathon. Well, the result of this was that I had to engage "other" means of seeing this, and I think that affected my enjoyment of this story. I was confused much of the time about whether the actor I was watching was an original or a ganger copy. I think I'm going to have to watch it on the big TV and re-evaluate the story, now that I've read your review. I clearly missed some critical parts watching the chopped up version I got to see on my laptop. Hi Frank, sterling review as always. 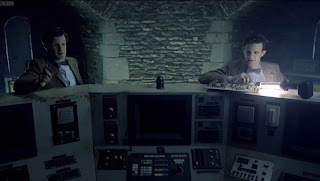 As I mentioned on the Planet Zog blog, one way of watching the episode is that the Doctor manipulates events enough so that the Future Flesh he knows likely he'll have to destroy isn't sentient, and he does this by making sure that Cleaves is alive by the end to testify to the then instability of the Flesh. Another way of looking at the episode is to read all of Jenny Gangers lines as Rik from the Young Ones. Well, maybe not, but by that I mean the central arc of her characterisation is similar of a militant student activist who is so overwhelmed with their cause that they forget the morality of their actions in fighting what they think is immoral. 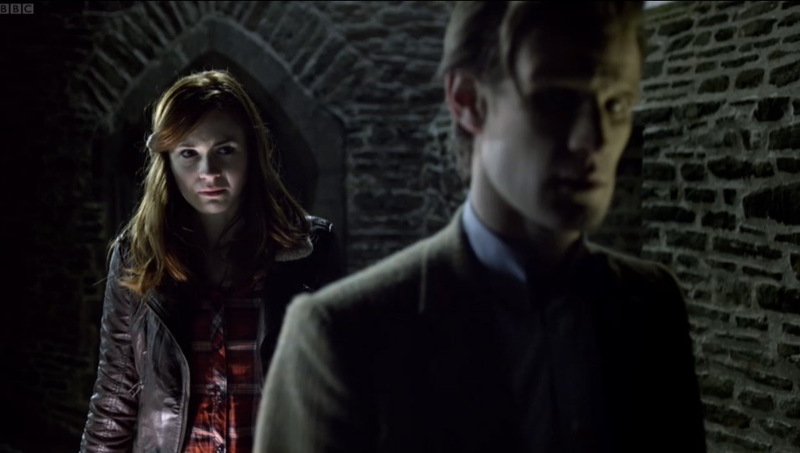 I also like the way that the naivety of Rory sets up his actions in the finale. By the time he gets to the Tardis at the end Rory knows that he should actually listen to the Doctor, no matter what conflicting emotions he may have-- I doubt he'd have been as likely to do so had he not been duped so easily. And while I may question Rory's likelihood of abandoning his wife at a time of danger at the end of the Rebel Flesh, his fascination with Jenny (ie-- someone who he feels needs him, as opposed to his strong wife) does make sense. And it seems fitting that this is recognised as a weakness to be utilised by the increasingly militant Jenny. It's fascinating in a way to explore the scripts of The Rebel Flesh and The Almost People not as science fiction/fantasy but as the genres Graham traditionally writes in: mystery and drama. In many ways this could have been an episode of Ashes to Ashes as far as motivations of characters go, and we are shown the extremes of radicalism, the betrayal of good causes and an exploration of bigotry. All this filtered through the body horror aand gothicness of mid 70's Dr Who, and an eyeball section is lovingly Cocteau-ian. While not the best episode of the season, it does reward rewatching. I just did a furious Google search to re-find your site and your marvelous Doctor Who episode reviews (which I had stumbled across weeks ago and stupidly NOT added to my RSS feed at the time). Thank you for writing these. Through your thoughtfulness and insight, I'm able to savor the episodes even more (not a small feat considering that I'm an enormous dork who looks forward perhaps more than any grown-up should to her Saturday night "dates" with the Doctor...dear God, I *did* just type that, didn't I?). Thanks again for the lovely reviews! Many inconsistencies have been noted with this story but the most annoying one for me is the appearance of the Gangers. When the script demands the monster they all run around with runny noses (cheeks, chins, eyes, etc.) but when the scenes call for a perfect duplicate there they are, identical down to the last pore. Imagine the video 'phone call to the child if, halfway during Jimmy's scene, a storm of emotion caused his facial structure to melt down. One more kid who won't be coming out from behind the couch before Christmas. Many would let it slide but the point of this story is the Gangers feelings of their claim to humanity and their equal right to life. Identity is quite strongly connected to outward appearance and a place in society. I can see them trying to maintain their new structure whatever the effort and not just 'letting it all hang out' when no one is watching. For me, one interesting mental association thrown up by the pile of discarded flesh encountered by Rory was the DC Holocaust Museum's exhibit of piles of shoes. Also, having the Doctor literally walking a mile in another man's shoes to teach a lesson not only to himself but also to Amy was a good idea well executed. Now, Doctor's performance - A (took the '+' off when he started to give us his opinion on bow ties, no matter how amusing it was in stereo). Rory - A+ he may have started as the 'robotic dog' role but is now putting in some very strong and convincing performances, almost like some of the early companions who would argue bitterly against any decision made by the Doctor they found difficult to accept. Amy - well, I guess it's like a lot of marriages, 'He's nice, shame about HER'. The episode's end coming back to focus on the pregnancy, EPL (Eye Patch Lady) etc. was a downer for me. I just can't adjust to her. Nice idea though about EPL throughout the episodes being some sort of leakage between real and faux Amy's consciousness). Good performances from everyone else. A story built on great ideas, moody setting with murder-mystery-space-operacy-teen-slasher elements. Glad everyone is enjoying these reviews. I always try and see episodes from different perspectives where I can, so that the reviews remain interesting and thought-provoking. By the way, I recommend either subscribing to the RSS feed or if you're on Blogger just simply add yourself to the site's followers.